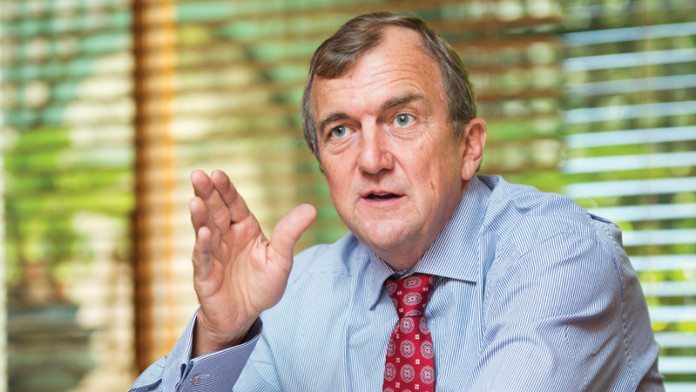 DISCUSSIONS between Barrick and the Tanzanian government over resolving the situation at Acacia Mining were proceeding along the lines agreed between Barrick executive chairman, John Thornton, in his initial discussions with Tanzanian president, John Magufuli. That’s according to Barrick CEO, Mark Bristow, who said the foundation for the “outcome of this situation” was an agreement that a 50/50 share of the economic proceeds between the mining company and the state “… should be acceptable to the industry”. Speaking on Monday at a media breakfast at the Mining Indaba 2019 being held in Cape Town, Bristow commented: “That’s easy to measure on an economic basis after capital recoupment”. Bristow said this guidance included a settlement on tax claims levied on Acacia by the Tanzanian government at around $300m despite government claims against the company running into the billions. Asked for the precise amount being claimed from Acacia in taxes Bristow replied: “What number do you want to use?” Bristow added: “I have no doubt that we will get there. We are absolutely clear we will bring this stand-off to an amicable resolution. There is no way out other than a positive outcome. Bristow said that he had not yet met President Magufuli, but that he would do so. He refused to specify when that meeting would be and also to put a timetable on the discussions. “You cannot negotiate in Africa against a deadline. It is really bad form to try and do that. Bristow said Randgold: “… had always been interested” in Tanzania – particularly the North Mara mine – despite selling the former Golden Ridge to Barrick in 2011. “We have always said we would go back there because it’s elephant country and Tanzania was a leader in the attraction of capital into Africa if you go back to the early ‘90’s when they introduced the most generous mining code in the emerging world. “People get aggravated when they have presented legislation and made promises on the political front and the investor side and then they don’t materialise and there’s no step-up to work towards finding a solution. Things change with time. The generous regime appears to have been abused. It is generally civil to negotiate in good faith and get out of the stalemate. Arrogance does not help investors. Open your hearts and see your Veins are same as people where your investments are located. Some companies have behaved like conmen, characters of straw with bone deep fake confidence. That cannot be allowed to go on and on. Multi-nationationals should not behave and continue to regard all countries that have these resources as derogatory “banana” republics. Cheating, fraudulent behaviour, through transfer pricing, underdeclaration of profits and all other satanic undercuttings. On the other hand, host countries should not regard all investors as thieves and should allow them to recover a realistic value on the return of their capital. In the parlance of investment law this is referred as “win-Win situation”. It requires honesty and God like mentality.